Foster + Partners just announced plans to partner with the European Space Agency on an ambitious project to 3D print structures on the moon! The project will be a lunar house for four people that can withstand the threat of meteorites, gamma radiation and temperature fluctuations. Since transporting building materials to space is a challenge, the team is considering using on-site 3D printing as a solution. Foster + Partners‘ moon base is a landmark project for the field of 3D printing that could pave the way to lunar colonization in the future. Part of the lunar base could be transported by rocket in a tubular module that also serves as the protected entrance to the base. The tube entrance leads into an inflatable dome that serves as a support structure and defines the shape of the base. Inside, a 3D printer operated by a robot would print a protective shell of regolith layer by layer over the inflatable dome. The structure designed by Foster + Partners is being tested with simulated lunar soil at a smaller scale in a vacuum chamber, which is similar to the non-atmospheric lunar conditions. If the project is given a green light, the lunar accommodations will be based at the moon’s south pole, which receives non-stop daylight. Along with Foster + Partners, the ESA is working with Italian space engineering firm Alta SpA, Monolite UK (for the 3D printer) and Scuola Superiore Sant’Anna University. 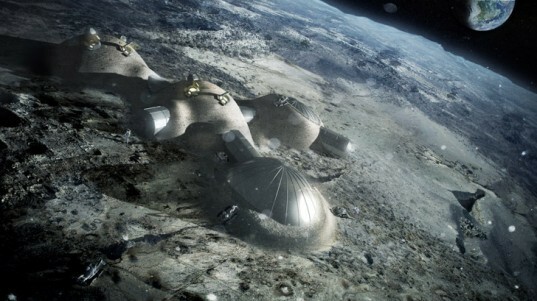 Foster + Partners' moon base is a landmark for the field of 3D printing that could pave the way to lunar colonization in the future. Part of the lunar base could be transported by rocket in a tubular module that also serves as the protected entrance to the base. The tube entrance leads into an inflatable dome that serves as a support structure and defines the shape of the base. Inside, a 3D printer operated by a robot would print a protective shell of regolith layer by layer over the inflatable dome. The structure designed by Foster + Partners is being tested with simulated lunar soil at a smaller scale in a vacuum chamber, which is similar to the non-atmospheric lunar conditions. 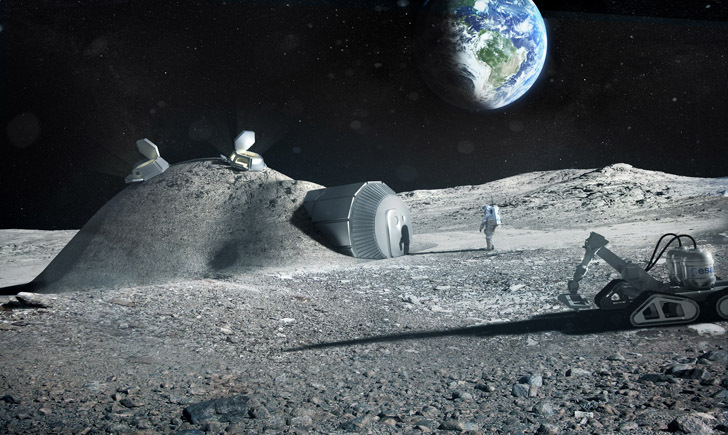 If the project is given a green light, the lunar accommodations will be based at the moon’s south pole, which receives non-stop daylight.